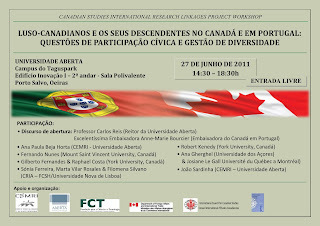 On the afternoon of Monday, the 27th of June, from 14:30 to 18:30 at the new TagusPark campus of Universidade Aberta (Edifício Inovação I - 2nd floor, room polivalente), myself, João Sardinha, am coordinating the Canadian Studies International Research Linkages Project Workshop: Luso-Canadians and their Descendants in Canada and in Portugal: Questions of Civic Participation and Diversity Management. "When the idyllic becomes a myth: Portuguese-Canadian descendants narrate pre- and post-return to Portugal" - João Sardinha (CEMRI-Universidade Aberta, Lisbon). The event will also host the Canadian ambassador in Portugal, the Honourable Anne-Marie Bourcier who will provide the opening address. Entrance is FREE. Please come join us if these issues are of interest to you.